Pōkā Laenui (Hayden Burgess), J.D. Pōkā is a native son of Hawai`i, and like others, was taught to love the U.S., enough to give his life in war. Like his male siblings, he volunteered in the active U.S. military service. While in that service, he came upon “Hawaii’s Story by Hawaii’s Queen” in 1970. He took a new direction – a commitment to break from U.S. colonization and restore Hawaii’s independence. He returned to the study of law after military service, earning a Juris Doctorate in 1976. He returned to his Wai`anae community which elected him in 1968 to the State Constitutional Convention., opened his law office, and pursued his work for Hawaiian independence. He has been credited as the father of the modern Hawaiian Sovereignty movement, bringing challenges throughout the State and Federal courts in Hawaii, asserting the court’s lack of jurisdiction over Hawaiian nationals as well as over the territory of Hawaii. Using the courts and the criminal system, he introduced the hidden history of U.S. aggression into Hawai’i, the U.S. plotting in a collusion with principally U.S. businessmen, the snatching of Hawai`i and the numerous violations of domestic and international laws in that theft. His use of the courts as a public education platform spread this information throughout Hawaii. Today, many others have joined in this practice, challenging U.S. jurisdiction over Hawaiian nationals. Finding the judges too deeply engrained in protecting U.S. interest rather than principles, he expanded his activities into the political, media and international arena. He was elected O`ahu’s Trustee with the Office of Hawaiian Affairs (1982 – 1986), constitutionally established by the people of Hawai`i four years previous. He wrote and lectured across Hawai`i of the history, of international legal principles of self-determination, of the evils of colonization and of Hawaiian nationhood. In 1983, he joined the World Council of Indigenous Peoples, elected its Vice President, and tasked to be the political spokesperson at international forums, including the United Nations various bodies. In the late 1980’s he played an instrumental role in the drafting of the U.N.’s Declaration of Rights of Indigenous Peoples, selected as the Indigenous Expert to the International Labor Organization’s writing its Rights of Indigenous Peoples convention (ILO 169), and selected to address the General Assembly of the U.N. in 1991 where he was acknowledged as one of five pioneers in the development of indigenous peoples rights. 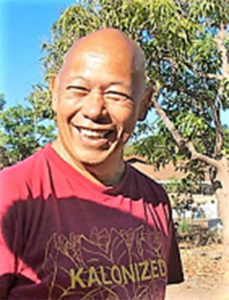 The principle body of his work can be found at www.hawaiianperspectives.org. While in Hawai’i, Pōkā led his community’s mental health center integrating indigenous knowledge in treatment of mental illness, substance abuse, family services, and psycho-social programs, receiving honors and national recognition. He continues his practice of law, his radio and television shows, his writings and teachings, a bit of farming and Tai Chi Chuan. He is father of 3, g-father of 1, husband of 50 years to Puanani Burgess, and constant advocate of human rights and fundamental freedom for all. Pōkā’s shirt advocates “kalonized” (kalo – a traditional tubar plant found world-wide, regarded as the elder brother of the Hawaiian people).